Tanya Heath Paris to Shutter Only Canadian Location at the end of March: In October 2014, the innovative footwear brand Tanya Heath Paris launched its Canadian flagship in Toronto on Old York Lane in Yorkville. The brand was the first in the world to provide interchangeable heels which can be attached and removed by the click of a button on the shoe itself. The benefits are twofold — the shoe’s appearance can be modified with new heels while also modifying the shoe’s height, depending on what the wearer desires. Early 2018 saw the flagship relocate into a 1,000-square-foot retail space at 126 Cumberland Street. The new space provided exposure to the busy Cumberland Street traffic, and close to the Village of Yorkville Park which is a centre of event activity. The company website has all items marked down over 60 percent with a large CLOSING SALE banner on the home page. Tanya Heath Paris was founded in 2009 by Canadian Tanya Heath, who now lives in France. Ms. Heath was born and raised in Ottawa and moved with her husband to France in 1996 where she studied business, specializing in strategy and new technologies. She struggled to find shoes that were versatile enough for her busy lifestyle — something fashionable enough for work, yet comfortable enough to take her children to school. In 2009, with the help of 14 engineers and technicians plus several designers and master boot makers, Ms. Heath created a unique company that boasted the world’s first adjustable height shoe with removable heels. According to the brand’s international website, Tanya Heath Paris operates locations in Paris, Beirut, Beijing, a pop-up store in Tokyo, and in seven retailers in France, Lebanon, Portugal, and the United States. A standalone storefront in Los Angeles also shuttered last year. Specchio Shoes Closes Toronto Storefront: Upscale Toronto-based footwear retailer Specchio has shuttered its last Canadian storefront, which was located at the southwest corner of Bay Street and Cumberland Street (1240 Bay Street complex) in Toronto’s affluent Yorkville area. The small retail space housed an impressive roster of footwear brands including Dries Van Noten, Barbara Bui, Marni, Margiela, Aquatalia, Giuseppe Zanetti and others. For months, the store had signage up for a ‘renovation sale’ and last month, paper over the windows indicated that the store was under renovation. Instead, the retailer has shuttered its operations entirely with a for lease sign. Jonathan Dixon of brokerage Cushman & Wakefield is listing the space. Specchio also operated a store in Montreal for five years at 2025 rue de la Montagne, which shuttered in May of 2009. Christofle Paris now occupies that space. Duer Denim is Bringing Their Playground Approved Brand to Toronto: Canadian fashion-meets-function brand DUER is set to open its second location with a new flagship store in downtown Toronto. This store will celebrate the brand’s men’s and (newly launched) women’s jeans, pants, and shirts, showcased with the second installation of their unique performance denim playground. With a launch date of April 5th and located at 491 Queen St. West, DUER’s newest storefront is intended to motivate their customers to bike, jump, climb and swing in their gear, all while testing out the clothing’s amazing performance attributes. Founder Gary Lenett is a 30-year veteran of the apparel industry, but it was with DUER’s first permanent store in Vancouver’s Gastown neighbourhood, his first foray into retail, that he and his team developed the innovative playground concept, that caught the public and the media’s attention. 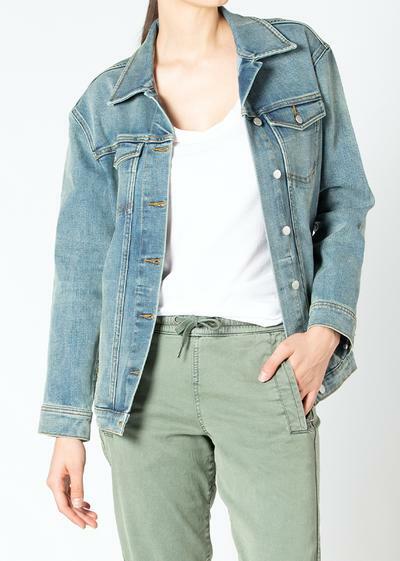 The Toronto store will carry the recently released new collection of active denim for women in skinny and slim straight silhouettes, a jogger, and a denim jacket. The new collection features technical proprietary fabrics that offer power stretch, moisture-wicking, breathability and durability, while maintaining the look and feel of premium streetwear. The line was released on International Women’s Day and DUER donated $20 for every piece sold from March 7-11th to the Women’s Health Collective in Vancouver’s Downtown Eastside. The DUER collection is sold in over 300 retailers in 150 cities across North America and Europe. 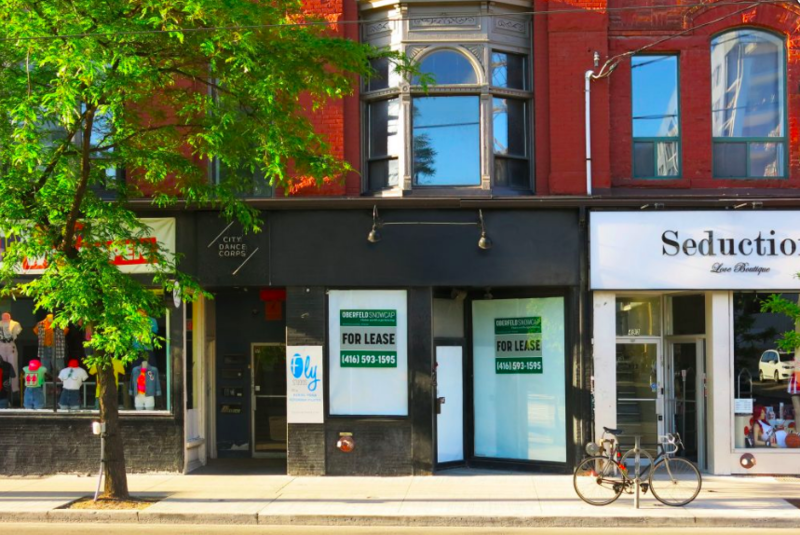 Brokerage Oberfeld Snowcap listed 491 Queen Street West and acted on behalf of the landlord. Hilary Kellar-Parsons of brokerage Avison Young represented DUER in its lease negotiation for the new Toronto store. Retail Insider will post photos when the store opens next month. If it’s anything like the Vancouver store, it will be worth checking out. La Maison Simons to Launch First Private Label Collection: Quebec-based La Maison Simons is launching its first private label line - Lecavalier + Edito. 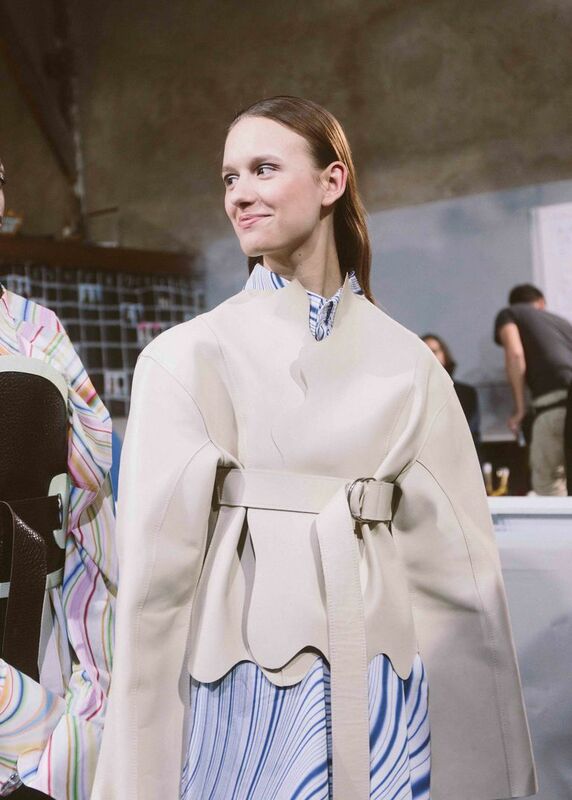 It is inspired by designer Marie-Ève Lecavalier, who received the Chloé Prize at the 33rd edition of the Hyères International Festival of Fashion and Photography. The strategic collaboration features clothing, accessories, and footwear with a strong sense of the style of the late 1960s and 70s. Lecavalier’s pieces from her ‘Come Get Trippy With Us’ collection are imbued with a psychedelic palette of the times with bright citrus shades, turquoise blues, and wavy patterns, and are priced from $30 to $595. The collection launches this month and will be available at nine Simons stores across Canada and online until September 2019 for those looking to add some vibrancy to their wardrobes. The 179-year old company now has 15 stores across Canada, including locations in Vancouver, Calgary, Edmonton, Mississauga, Toronto, and Ottawa. Recently they expanded their luxury designer offerings with the inclusion of top brands such as Balmain, Vivienne Westwood, Issey Miyake, Boutique Moschino, and SeeByChloé. In 2020, the company will open an automated fulfillment centre in Quebec City at the cost of $215M, followed by a new store in suburban Montreal. Murphy’s Law and Moonshine: Located one hour west of Toronto in the small town of Elmira, Ontario, Murphy's Law Distillery produces traditional Appalachian moonshine. Owned and operated by the Brothers Murphy, Ben and Sullivan focus on sourcing local ingredients for their many flavours of "Shine" which range from 20-40% alcohol content. Ben, the older of the brothers, acquired the skills of distilling moonshine while at university in West Virginia. Hermès Prepares to Unwrap Highly Anticipated Vancouver Flagship: Excitement is ramping up in Vancouver’s ‘Luxury Zone’ as French luxury brand Hermès prepares to remove the hoarding from its new Vancouver flagship on the southwest corner of West Georgia Street and Burrard Street. Clad in the signature Hermès orange, the building with its scaffolding has impacted the walkability of the high-traffic intersection. The new location is replacing previous occupants: a Bell Mobility retailer, Montblanc, the Chevalier men's store, and Suki's hair salon which was located on the second floor. Last June, when construction began on the location, Hermès neighbours were a Starbucks and the Birks-owned jewellery retailer Brinkhaus, but in December 2018, Brinkhaus transitioned to become home to Birks Group’ Patek Philippe and Graff Diamonds. The new Hermès location is said to feature a 100-foot street frontage along West Georgia Street and an additional 35-feet along Burrard Street. Known for their eye-catching window displays, we are sure those put out by the scaffolding over the past 6-months will feel that the inconvenience was well worth it once the new windows are revealed! Sleep Country Canada Partners with Walmart to Offer Bloom Mattress-in-a-Box Online: Canada’s biggest mattress retailer, Sleep Country Canada, is teaming up with Walmart of the first time to offer its Bloom mattress-in-a-box on Walmart.ca. The collection launches online on March 14, with the Bloom mattress collection starting at $295. "We are very excited to partner with Walmart on this great initiative. We are two very like-minded retailers focused on world class customer service, high quality products and a convenient purchase experience making the partnership a natural fit," said Stewart Schaefer, Chief Business Development Officer of Sleep Country Canada. "Walmart has enormous reach within Canada with over 23 million visits to their website every month and over 80 per cent of Canadian households shopping at Walmart. We could not think of a better partner to help bring more Canadians a great night's sleep with Bloom," added Schaefer. Walmart.ca will feature the full Bloom collection of four mattresses in all sizes – Cloud, Air, Mist, and Earth – plus the Ploom pillows, Bloom toppers, and Bloom platform box will also be available. The mattress-in-a-box phenomena appears to be here to stay, with more than 100 companies competing for market share. Last month, Sleep Country Canada acquired Canada’s top-selling mattress-in-a-box brand Endy. Other brands such as Casper are also competing — Casper now operates two storefronts in Toronto, with more on the way. Vancouver Fashion Week Target of a Frustrated Fashion Scene: An incredibly overdue article exposing the ‘underbelly’ of Vancouver Fashion Week was published this week in Vancouver Magazine. Penned by new editor Lucy Lau after a dozen interviews with fashion insiders, the article is spreading like wildfire through social media. The piece focuses on the event, which from the outside, is perceived as a legitimate ‘fashion week’ assumed to be associated with the star-studded New York Fashion Week or Paris Fashion Week, but in actuality has no association with them. As the only person interviewed by Lau for the article “I Don’t Know How People Can Defend It”: Past Participants Shed Light on “Underbelly” of Vancouver Fashion Week, who agreed to have her name used, Kelsey Barnwell is now in the limelight as the coordinator of a protest which will target the VFW Opening Gala where she hopes others will join her to stand-up against a for-profit event which operates through the unpaid labour of hundreds of interns/volunteers. In 2015, Barnwell was 19 years old when she walked in her first VFW, eager to build her portfolio and runway experience. After three seasons, she was done. ‘Volunteering’ for 10-12 hour days, with little food or water, and unsafe working conditions which included male photographers having access to backstage where models were changing, many under 18 years of age. Unbeknownst to her, all of these same experiences had been well documented in 2011 on a now archived wordpress.blog called Vancouver Fashion Weak. Included in the call-out to join the protest is anyone who provided free labour for VFW as interns, volunteers, models, HMUA; vendors who were never paid, sponsors who receive little to no ROI, and designers who paid thousands upon thousands of dollars to meet buyers, distributors, manufacturers, international media, and others who received only applause after their runway presentation, will support her in speaking up against VFW and its practices. For 32 seasons Vancouver Fashion Week and its owner Jamal Abdourahman maintain that the twice annual event is serving the local fashion community, although no one is clear how. Season after season of pay-to-show designers ($5K to $13K), one is hard-pressed to find a recognizable designer name from the 1,000+ of those who have participated. It is also telling that their online list of Media Partners doesn’t include any of Vancouver or Canada’s recognized media, and consists only of small press and blogs from places like Portugal, New Zealand, and Montenegro, with half the nine listed publications without active hyperlinks, and one is clearly marked as sponsored. The city and its creative’s deserve better and progress is being made with the launch of numerous events such as Indigenous Fashion Week, South Asian Fashion Week, SFU Fashion Week, and Water Me. Local design schools like JCI Institute, Kwantlen Polytechnic University, and VCAD, are known for creating incredible runway experiences for their students at a fraction of the cost.